Next Monday, Raffles Jazz will be holding their concert, Replay! With Replay, Raffles Jazz will take us deeper into the well-loved fairy tale of Little Red Riding Hood, where we will find out what really happened in her fateful encounter in her grandmother’s house. Unfortunately, tickets have already sold out – and within 50 minutes to boot! 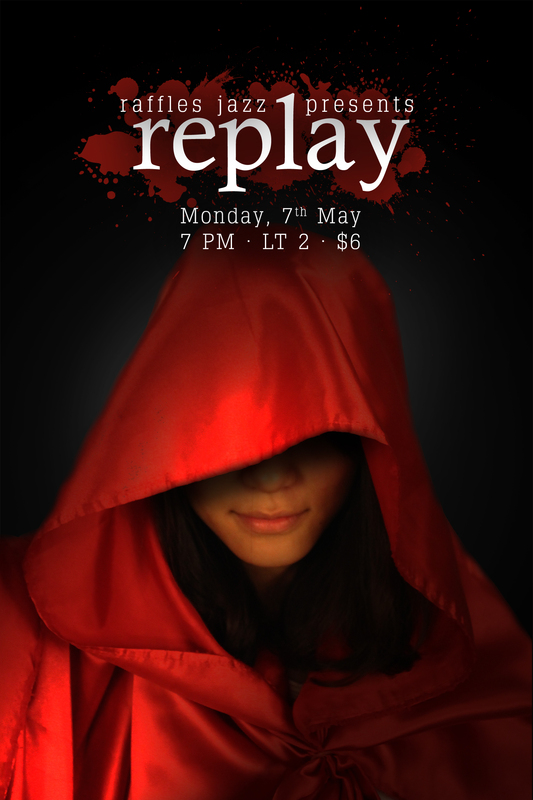 No doubt you have noticed their creepy yet extremely well-designed posters around school, which have contributed to much of the hype over Replay. Thankfully, we do not have long to wait! Raffles Press visits the President of Raffles Jazz, Priscilla Goh, to find out more about Replay. What can we expect from the concert – is there anything exceptional that makes Replay oustanding? In terms of ‘outstanding’, I would compare this year’s Jazz concert to previous years’, not really the other performing arts concerts because that would, well, be a pretty unfair comparison. What makes Replay particularly outstanding as compared to previous Jazz concerts is really the structure of concert this year. Past years’ concerts have mostly been either full-on jazz or a mix between jazz and storyline, like last year’s. We decided to rethink our structure and this year we thought that we wanted our show to have 2 main purposes. The first is to show people what a proper jazz performance is like hence our first half is a full-on jazz performance. It will enhance the audience’s understanding of what jazz is about and what we can play. People have a notion that we do a lot of music of a certain style and the first half is to let them know that hey, we actually have a pretty diverse repertoire available. And even what we’re playing for concert, it’s like the tip of the iceberg, there’s really so much more to jazz and what we display is like a sample from an unending gift bag. The second is to show how jazz can be entertaining and that’s why you’ll see a storyline with jazz music. You guys sold out in 50 minutes, that’s quite a feat! How do you feel about that? YES WE SOLD OUT IN 50 MINUTES! Even now I’m pretty shocked when I think about it, I knew many people wanted tickets but I didn’t expect tickets to go out so fast. Well, I guess I’m happy because as a performing arts group having a full house audience in a concert you organise is just… it’s pretty hard to describe. It sort of makes you high, haha. But yes, it means the pressure is pretty high as well for a performance to meet everyone’s expectations. How has organisation, practice and everything else been so far? Everything has been super hectic these few days! It’s the last week till concert and everyone is really working hard. It’s really quite heartwarming to see this small group of people bond over all the concert preparation activities and well, I can’t ask for anything more than this. Because what’s as important as putting up a successful concert for me is that everyone puts up this concert together and in the process they learn, get to know each other and we become this second family that will be what becomes a defining moment in JC. Is there anything else you may want to add? Check out the Replay Facebook event page here!